After a lopsided pair of games to open the series at Coors Field that saw the Padres outscore the Rockies, 29-9, the two teams reined it in as Colorado took the finale, 6-3, on Sunday afternoon behind the club's first quality start of the season from Chad Bettis. Colorado returned to the long ball to get the early lead, scoring five of their six runs on five solo shots -- including two from Carlos Gonzalez and another from rookie Trevor Story, his seventh of the season. "When we're taking our at-bats the right way, it's a tough lineup to get through," Rockies manager Walt Weiss said. "There's really no breathing room. If we can keep it within striking distance, with our offense, we're going to come from behind to win some games, put some distance between us late." After the Padres tied the game in the third, the bottom of the Rockies' order played a little small ball to reclaim the lead, with Tony Wolters singling to lead off the fifth with his first big league hit. Wolters scored on Charlie Blackmon's fielder's choice, giving Colorado a lead it would not relinquish. "I was just trying to have a good at-bat," Wolters said. "Find a good pitch to swing at. I was trying to get ready later, because I knew an offspeed [pitch] was coming. I was still out in front. It was a changeup. I just tried to keep my bat in the zone as long as I could, and I got a little hit." The Padres managed only one earned run off Bettis after a pair of singles from Melvin Upton Jr. and Christian Bethancourt to open the second inning were followed by a one-out double from Adam Rosales. They recorded an unearned run in the third with inning-opening singles from Jon Jay and Cory Spangenberg, with the runners advancing on left fielderGerardo Parra's fielding error of Spangenberg's single. Jay scored on a sacrifice fly from Wil Myers. Spangenberg added an RBI double in the eighth inning. "The biggest part was he pitched [inside] effectively," Upton said of Bettis. "It wasn't just for show. He was able to throw strikes in there consistently today and made us respect it, and he worked his slider off of that." Back-to-back jacks: After going homerless Saturday night for the first time this season, the Rockies got back on track with back-to-back home runs in the first inning. 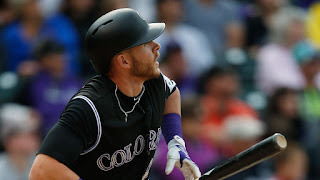 Gonzalez launched a two-out solo shot into the left-field seats, and Arenado followed with a 462-foot homer -- tied for the longest of the season -- to give the Colorado a 2-0 lead. It was the second set of back-to-back homers for the Rockies, with Story and Gonzalez combining for a pair on Opening Day in Arizona. Story and Gonzalez went back-to-back again in the eighth, as the rookie shortstop led off the inning with his seventh homer in his first six games of his career -- a 425-foot shot to left -- and Gonzalez bookended it with a 428-foot blast to the second deck in right. "That's part of our team," Gonzalez said. "We've got thump in our lineup. We have a lot of power. I believe anyone can hit the ball out. A great pinch-hit by [Ryan] Raburn, too. As long as the pitchers give us an opportunity to score runs and keep the game close, we're going to have some great success." Big bullpen: Miguel Castro had a huge hold in the eighth inning, coming in with one out, a man on second and a run already in to cut the Rockies' lead to one. Castro faced Matt Kempand Myers, inducing groundouts from each to end the inning and the Padres' last threat. "With the couple of short starts in a row, our bullpen was taxed," Weiss said. "I didn't want to use Castro for too long today. But I knew if we got to that part of the order, he's the guy I wanted to go to against their big right-handed hitters." Out of reach: Right-hander Brandon Maurer took over for Shields in the eighth inning and gave up the back-to-back homers to Story and Gonzalez to open the inning. The two blasts increased the Rockies' lead to three and gave Colorado closer Jake McGee breathing room in the ninth. Rockies second baseman DJ LeMahieu extended his hitting streak to six games, lacing a double down the right-field line. His 1-for-5 outing lowered his average to .478 and ended a five-game multi-hit streak for him, the longest such streak to start a season in Rockies history. LeMahieu hit .571 (8-for-14) during the stretch. San Diego: The Padres begin a four-game series at Philadelphia on Monday when the Phillies play their home opener. Andrew Cashner will start after giving up five runs in four innings in the Padres' 7-0 loss to the Dodgers on Wednesday. Colorado: After a day off Monday, the Rockies host the Giants for the first game in a three-game set Tuesday. Tyler Chatwood climbs the hill for Colorado, hoping to build on a strong first start. He pitched 6 1/3 innings for the win Tuesday in Arizona, allowing two runs (one earned) on seven hits and no walks while striking out three.